American rabbi; born at Wabash, Ind., Aug. 9, 1862; educated at the public schools of Columbus, Ohio, the Hebrew Union College of Cincinnati (graduated 1883; D.D. 1886), the University of Cincinnati (B.A. 1883), and Johns Hopkins University, Baltimore, Md. On Jan. 1, 1884, he became rabbi of the Har Sinai congregation at Baltimore, Md., which position he held until Nov. 1, 1888, when he became rabbi of the B'ne Israel congregation of Cincinnati. He is also professor of homiletics at the Hebrew Union College. Philipson has held many offices of a public nature in Cincinnati. He has been a trustee of the Associated Charities (since 1890); trustee of the Home for Incurables (1894-1902); director of the Ohio Humane Society (since 1889) and of the United Jewish Charities (since 1896); corresponding secretary of the Central Conference of American Rabbis (1889-1892; 1894-98), and director of the same society (since 1898); governor of the Hebrew Union College (since 1892); director of the American Jewish Historical Society (since 1897); member of the publication committee of the Jewish Publication Society (since 1895); and president of the Hebrew Sabbath School Union of America (since 1894). He is the author of "Progress of the Jewish Reform Movement in the United States," in "J. Q. R." x. 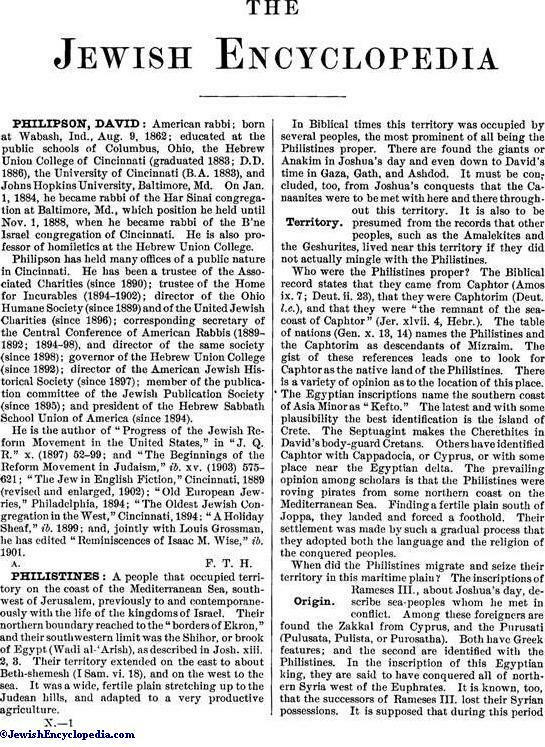 (1897) 52-99; and "The Beginnings of the Reform Movement in Judaism," ib. xv. (1903) 575-621; "The Jew in English Fiction," Cincinnati, 1889 (revised and enlarged, 1902); "Old European Jewries," Philadelphia, 1894; "The Oldest Jewish Congregation in the West," Cincinnati, 1894; "A Holiday Sheaf," ib. 1899; and, jointly with Louis Grossman, he has edited "Reminiscences of Isaac M. Wise," ib. 1901.